Dave Frecklington has guided Matlock to safety. Matlock Town’s Premier Division place for next season was finally confirmed when they won their six pointer at Marine on Tuesday night. It’s a case of task completed but job not done for boss Dave Frecklington ,whose aim when appointed back in September was to steer the bottom of the table Gladiators to safety. It’s mission accomplished with four games to go in a topsy-turvy campaign which saw his era at the Proctor Cars Stadium commence with three defeats before a rally of only one league defeat in 15 league games from October 1 to New Year’s Day had Matlock sniffing at the play-offs. 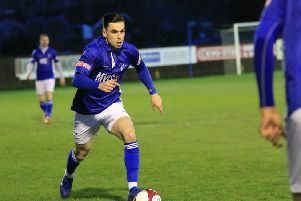 But discounting a home win over the now defunct North Ferriby United, Matlock have won only two league matches in 2019 but have nevertheless reached their safety target with four games still to go. Workington cannot catch Matlock and Bamber Bridge and Mickleover appear to be most perilously placed. Bamber Bridge trail Matlock by 11 points with four games left, while Mickleover would need maximum points from their last three matches and hoping Matlock don’t collect another point to overhaul them. But given the fact Bamber host Mickleover on the season’s final day, neither club can therefore find enough points to trouble Matlock. He said: “That was a big performance and one that’s been coming. The lads stood up to be counted. It was a proper Dave Frecklington team performance, full of guts, aggression but it also had a lot of quality. “We kept to our beliefs - it was good to get Craig Westcarr and Marcus Marshall back firing up front, Nathan Whitehead and Michael Hollingsworth were fantastic in the middle of the park. “Michael Williams and Callum Chettle were a danger down the sides and Greg Tempest slotted in at left-back superbly. “It reminded me of how well we battled up at Whitby Town and in general during that great run we had a while ago. It was a good pitch to play on”. “Not having a settled team is one, now we’ve got our big players back like Marcus Marshall and Craig Westcarr in attack. “Also the penny needed to drop with certain players, we’ve all uttered a few home truths, we’ve simply not been good enough in 2019, players, management, all of us. “We’ve had injuries, I don’t want to use the injury list as an excuse, but it’s a fact that we’ve been very badly hit.